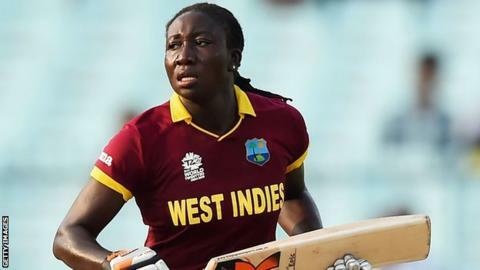 Stafanie Taylor put in a fine all-round performance as West Indies defeated an incredibly sloppy England by 42 runs in the fourth one-day international. Home captain Taylor made 85 as West Indies posted 223-6, helped by four dropped catches and a missed stumping. The tourists were well placed at 133-1 in Kingston after half-centuries from Tammy Beaumont and Lauren Winfield. But five run-outs and three wickets from Taylor saw England bowled out for 181 and the series levelled at 2-2. The fifth and deciding match will be at the same Sabina Park ground on Wednesday. West Indies' win not only keeps the series alive, but also means England cannot secure World Cup qualification in the Caribbean, having lost the second of the ICC Women's Championship fixtures. Though the tourists were disadvantaged by losing the toss - all four matches in the series have been won by the side batting first - they were hampered by their own mistakes in the field and running between the wickets. But that is to take nothing away from Taylor, whose 129-ball knock was both imperious and chanceless. No team had ever overhauled a score of more than 222 to win a women's ODI in the Caribbean but, for some time, that record looked under threat. England openers Beaumont (57) and Winfield (51) shared 95, with Beaumont in particular showing power down the ground in a 52-ball half-century. After she was caught and bowled by Taylor, Heather Knight joined Winfield in a stand of 38 until England imploded in spectacular fashion. Winfield was run out in a mix-up with Knight, Danni Wyatt fell in the same fashion, Georgia Elwiss was short of her ground after a poor call and Brunt was stranded in another breakdown in communication. By the time Taylor had Knight caught and bowled for 36, England had lost four wickets for four runs and the game was as good as gone. Fittingly it was a fifth run out that ended the match, Taylor - who took 3-22 - was involved yet again with a direct hit that accounted for Laura Marsh. Taylor's superb bowling and fielding display followed a second half-century of the series that anchored the Windies on a sluggish Sabina Park surface. After the hosts collapsed to 108 all out in losing the third ODI, Taylor displayed a new approach of careful accumulation with occasional shows of aggression, initially in a partnership of 69 with Shaquana Quintyne. England's first dropped catch - Hayley Matthews put down by Marsh - cost them only one run, but it was only when Quintyne was brilliantly caught in the deep by Wyatt off Knight that the errors began to creep in. Alex Hartley did not get hand on a skier off Deandra Dottin - reprieved on two before going on to make 18 - while Merissa Aguilleira could have been stumped by Amy Jones on nought and was then dropped on three and 11, both times by Jenny Gunn. She went on to make 32. Aguilleira added 45 with Taylor, who missed out a century when she miscued Knight's off-spin to extra cover. There was still time for the swift running of Stacy-Ann King and Shemaine Campbelle to visibly frustrate England, but that was nothing compared to the disappointment that was to come. England opener Tammy Beaumont told BBC Sport: "We played 90% of the game how we want to play, but the 10% has let us down - poor decisions for the run-outs and a few dropped catches in the field. "Being 90-0 and all out for 181 is not ideal. We know how hard it is to come in on these wickets, so myself and Lauren Winfield have to go on in the way that Stafanie Taylor did. "It was nice to get off to a quick start, but I was very annoyed when I got out. I wanted to go on and bring the game home for the team, so that is something I have to look at in the next game." West Indies captain Stafanie Taylor: "I wasn't nervous, they actually got a brilliant start that the openers gave them but we just needed a breakthrough. "We actually watched a movie last night, one of those movies where you never give up and I think it actually came true today." Lauren Winfield and Tammy Beaumont gave England a great platform but mistakes, which they know shouldn't have happened, let West Indies back into the game. England are a team with a huge amount of character. They've got two days, and they'll look to come back fighting. You have to address what's happened, whether that's chatting with team-mates or coaches, but don't dwell on it too much. They have to hit training hard, and make sure they're mentally prepared going into the last match.